Narelle here. Happy New Year! You may have noticed we've taken a blogging break since mid-December. We do have a good reason to explain our absence. 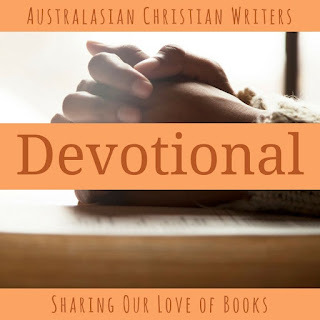 I'm excited to announce that Australasian Christian Writers has moved to a new website! We are launching our new website today! Please stop by and check out our new and improved website with monthly giveaways for our blog readers. Book Review - Liar's Winter by Cindy Sproles. Lochiel Ogle was born with a red-wine birthmark--and it put her life in jeopardy from the moment she entered the world. Mountain folks called it "the mark of the devil," and for all the evil that has plagued her nineteen-year existence, Lochiel is ready to believe that is true. And the evil surely took control of the mind of the boy who stole her as an infant, bringing her home for his mother to raise. Abused and abandoned by the only people she knows as family, Lochiel is rescued by a peddler and given the first glimpse of love she has ever known. The truth of her past is gradually revealed as is the fact that she is still-hunted by a brother driven to see her dead. Unsure if there's anyone she can truly trust, Lochiel is faced with a series of choices: Will she continue to run for escape or will she face her past and accept the heartbreaking secrets it reveals? Which will truly free her? Set in the wild and beautiful Appalachian Mountains of nineteenth-century East Tennessee, Liar's Winter is an unflinching yet inspirational exploration of prejudice and choice. Wow. What a story. This is frankly one of the best stories I’ve read in recent times. Certainly in 2018. It is simply breathtaking, as other reviews have mentioned. There’s a whole sub-genre of stories based around the Appalachian Mountains in America. Having a writer friend who is a local Appalachian I’ve found it an intriguing sub-genre. Lochiel (‘low-kill’) Ogle was born with a birthmark that disfigured one side of her face all the way down her neck and shoulder. In the late nineteenth century such disfigurement was considered the work of the Devil. Lochiel, as a baby, is taken from her sleeping mother’s arms and ‘adopted’ by another family. Besides having this birthmark she is also part Cherokee Indian that adds to the complexity of her background. We meet Lochiel at 19 with frequent backstory inserts by her brother, Gerald, plus her own reflections. When we meet her she has been left for dead having been bashed by Gerald. He dumps her in the forest only for her to be found by a wandering trader who goes by the name of Walt. Walt rescues her but we’re soon involved in a chase when Gerald finds out she is still alive. Driven by hatred, Gerard wants her dead. The themes of racism, superstitions, sibling rivalry, not fitting in, abandonment, and familial love are powerfully woven through this story. Love, forgiveness, and God’s truth are contrasted against the hatred and bitterness born out differences between cultures and race. We see the transformation of a young girl from being fearful, untrusting non-believing to a loving, God-fearing secure in God’s love young woman. The descriptions of the Appalachian Mountains are spectacular as we follow Lochiel and Walt in a journey that transcends the beauty of nature but also the wonder of familial love and faith. It is edge-of-the-seats suspenseful and spoken in the first person mostly by Lochiel we get to experience her native tongue (which I love) and all the variety of emotions she experiences on this journey of discovery and redemption. Perhaps it wrapped up a little too well but that would be my only slight criticism. If you’re pedantic and fussy about details, you will notice that my list includes more than 10 books. I’ve read more than those listed, but I couldn’t leave any out from this list. I won’t say anything if you don’t. These titles are presented in no particular order of preference. Read them all! This powerful testimony walks the reader through the author’s search for healing, and the many New Age practises she tried to find it. As an atheist, she had no intention of ever considering God or Jesus as an option, but the Holy Spirit had a way of bringing her to face what she had been ignoring—her need of the true healer. This trio of books make fascinating reading. As western Christians, we often read the Bible through our post-millennial, Western lens, and we often misunderstand what it was that the Jewish listeners of the First Century would have heard. Highly recommended reading as part of your Bible study. While I am technically the story editor, and minor contributor to this work, it is not my story. The day Jan Graham first shared it with me I said to her, ‘you have to write a book’. 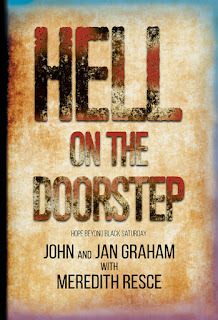 Neither John nor Jan are writers, and so I helped them craft this biographical account of how they responded when the Black Saturday bushfires were on their doorstep. This is the third novel by this author that I have read and thoroughly enjoyed. Tessa Afshar writes Biblical Fiction and it is outstanding. Land of Silence tells the story of the woman who had suffered for 12 years from bleeding and was healed, but that part of the story is not revealed until near the end. Most of the story introduces us to her and her family, set in First Century Jerusalem. The characters are engaging, and the plot well crafted. I highly recommend this author. This is the second novel I’ve read by this Kiwi author. Always want to support our regional Christian fiction authors—but it wasn’t a trial. I’m not a particular fan of the reality TV shows, though I’ve been known to watch an episode or two. This novel is set in the middle of a reality romance show – Falling for the Farmer. Set in Australia, and then out to Toowoomba Qld. If you like light romance, you’ll like this. I really enjoyed the wit of this writer. Bad boy athlete is forced into a media-stunt with sweet-heart author, posing as a couple. His popularity is supposed to gain her visibility in the media, her much-loved clean-teen romance is supposed to gain him respectability. Then they are supposed to call it quits…but you know what is bound to happen. I read a number of Roseanna White’s books this year. Roseanna was one of our sponsors for last years’ Omega Writers’ Conference, so I thought I’d best check her out. I was not disappointed. This particular novel set at the start of World War One, is a bit ‘Downton Abby’ in nature. Roseanna has historical novels set both in England and in the USA. I’ve really enjoyed her writing so far. This is also not the first novel I’ve read by this author. I’ve read a number set in medieval England, but this one is set in the frontier years of the US. The days when the railroad is pushing further west, and railroad towns are popping up. The main character is the eldest sister of a family of orphans, living in poverty in the slums of New York. She applies and is chosen to head out to a new railroad town to take on a job, forced to leave her siblings behind. Lots of drama and romance ensues. I love the fact that one of our Australia authors is making waves in the international market. Carolyn’s work stands up as good as, and sometimes better, than anything you will read from the US market. I have her books on pre-order, so that will tell you how much I enjoy them. Besides, I’m an Austen tragic. What’s not to love about well-written Regency Romance. And Carolyn writes well. 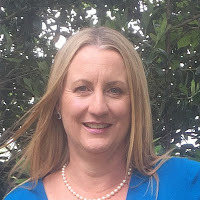 Amanda Deed is a solid Australian writer, and her work is set in Colonial Australia. This series, ‘Unnoticed’ and ‘Unhinged’ is a unique idea, where Amanda has taken the classic fairytales and set them in Colonial Australia. ‘Unhinged’ has another fascinating twist. Her retelling of Beauty and the Beast – our beast does not have a physical deformity, but Amanda has chosen to explore the drama of a man who experiences periods of dark depression—and in an era where mental illness was not understood or treated well. I’m not even sure how I came to buy this book, as it’s not in my usual Christian Fiction or Christian inspiration field, but I loved it. It is a time travel for a start with, and you will know I enjoy time travel from my own novel ‘For All Time’. But this was funny, quirky, and kept me on the edge for the whole book. Scientific time travel in the future, sent two people back to live in the past to solve a mystery. Oh the things that could go wrong, and the knock-on effects for future events. I loved it. What are your Top Ten Reads for 2018? Every year I volunteer to write a Top Ten post ... and every year I regret it. How can I possibly condense a year of reading into ten books? 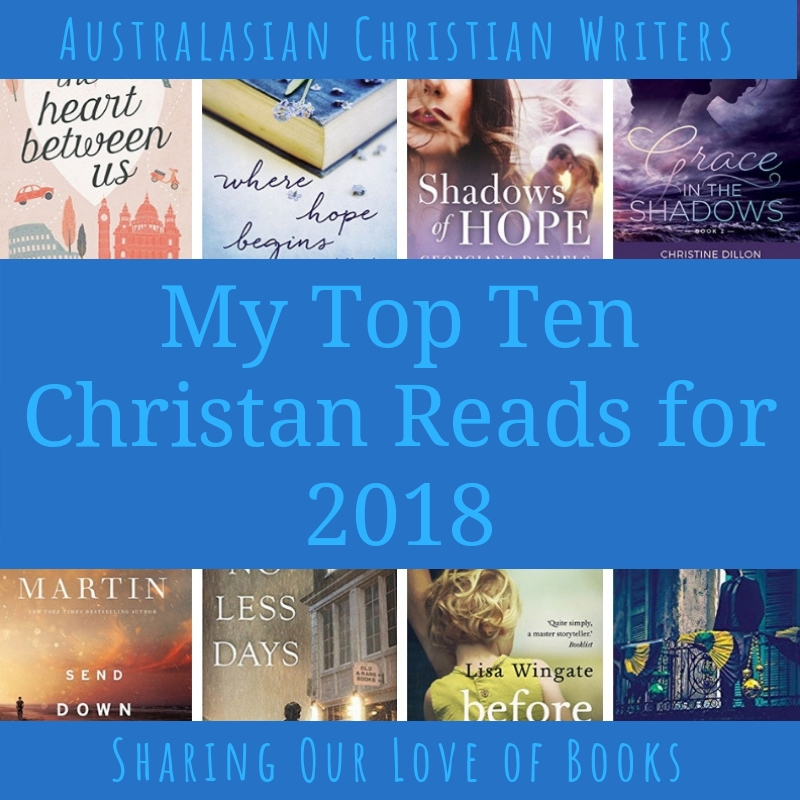 Last year I decided to cheat a little, and posted only my top ten contemporary Christian romance reads. I'm cheating again this year. I've already posted my five favourite new-to-me authors, and my top five romance read. 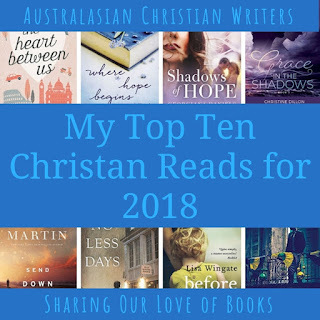 So today's post (which is cross-posted on my website) is my top ten Christian reads, excluding romance. An excellent thriller with a unique hook: a woman dies playing an escape room-type game designed by her husband, which makes him the prime suspect. He didn't do it, so who did? An infertile woman working in a pregnancy support clinic is counselling the woman pregnant to her unfaithful husband ... only none of them know it. A gripping novel which explores those problem areas where there are no right answers. Grace in the Shadows is a poignant and thought-provoking novel from Australian author and missionary Christine Dillon, one that is designed to challenge our thinking at the same time as giving us a good story with great characters. Click here to read a review by Fiction Aficionado. What would you do if you were the sole survivor of a train accident that killed twenty-two people ... but you can't remember it? That's the premise of this gripping and emotional novel. The recipient of a heart transplant meets the donor family, and is challenged to get out and live the life she has been gifted ... by ticking off the donor's bucket list, the 24 things she didn't get to do before she died. A powerful dual-timeline stories connecting a rare book, a second-hand bookstore, and pre-World War II Austria as Hitler comes to power and begins his persecution of the Jews. Plenty of twists and tragedy. Charles Martin novels always pack an emotional punch, and send down the rain is no exception. Yes, there's a slow build, but the payoff is more than worth it in this exploration of love, loyalty, and family, a story of sacrifice and second chances. David Galloway can't died. He's tried, but he can't. He's always thought he was alone, but he's watching TV one day and realises that he isn't alone ... Yes, No Less Days isn't your typical Christian fiction. It's more like Forever meets Highlander, part science fiction and part urban fantasy. Savannah's husband of twenty years has left her for another woman, the children are in boarding school and college and don't need her, so she does what any sensible woman would do: she runs away. It's a tough yet touching story about what women do when life disappears. I seem not to have reviewed this (probably because I bought it, and I'd already filled my reviewing schedule with review copies). It's a dual timeline story, with the past timeline telling the story of a family that is broken when the five children are stolen, shipped off to an orphanage, and adopted out. It's a compelling story, made all the more compelling and horrifying by the knowledge it's based on the real-life scandal of Georgia Tann and the Tennessee Children's Home Society. As I was compiling this post, I realised what all these novels have in common: a great hook. Yes, they all also have great characters, a strong plot, and excellent writing, but so did a lot of the novels that didn't make the list. These are the novels that have lived in my memory long past reading them and writing the review ... and that's because of the hook. Characters placed in unusual and often difficult situations, and being forced to work through issues and problems most of us will never face. Because that's the attraction of fiction: the way story can teach us how to deal with things in the real world. So what's the hook for your work in progress? What challenges do you give your characters? What about you? What are some of the best novels you've read this year? Do your choices have a theme, like mine did? Three Dummies in a Dinghy is the third instalment of the Stories of Life series. In it, ordinary Australians share their extraordinary stories of faith and life. 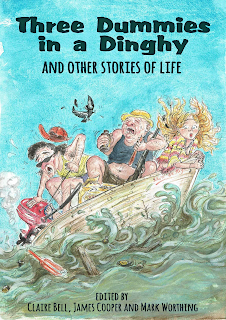 Some tales are humourous, others are entertaining and upbeat. But not all are happy stories. Many writers describe how they were found by a loving God in the midst of doubts and great suffering, and the circumstances don’t always get easier. But the message still comes through loud and clear that God is faithful, near and active in the lives of ordinary people. We discover that there are unsung heroes of all kinds among us. With their encouragement we can open our eyes a little wider, see more clearly, and trust more deeply in the boundless kindness of our Lord. Coffee, hot cross buns, and … murder? 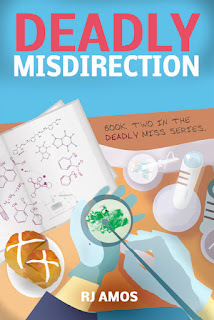 The anticipation of a five day break and the unexpectedly warm Easter weather makes Alicia eager to get going on her home renovations, despite the fact that she has absolutely no experience and is more at home with a test tube than a paintbrush. She is determined to get ahead with her laboratory preparations so that she can leave early and make the most of the Easter break. That is, until she discovers the dead body of a student in a car outside the chemistry building. Now all she wants to do is find out why Eloise died and not lose her job in the process. Come and join Alicia and her friends Jan and Nate as they solve another cosy mystery in the delightful small town of Kingston Beach, Tasmania. Must the shadows of the past destroy the hope of the future? In AD 122, Cornelia Scipia, proud daughter of one of Rome's noblest families, learns her adulterous husband plans to betroth their daughter to the vicious son of his best friend. Over her dead body! Cornelia divorces him, reclaims her enormous dowry, and kidnaps her own daughter. She plans to start over with Drusilla a thousand miles away. No more husbands for her. But she didn’t count on meeting Hector, the widowed Greek captain of the ship carrying her to her new life. Devastated by the loss of his wife and daughter, Hector’s heart begins to heal as he befriends Drusilla. Cornelia’s sacrificial love for Drusilla and her courage and humor in the face of the unknown earn his admiration…as a friend. Is he ready for more? Marriage to the kind, honest sea captain would give Drusilla the father she deserves…and Cornelia the faithful husband she’s always longed for. 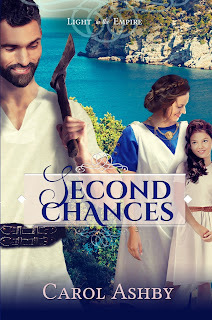 But while her ex-husband hunts them to drag Drusilla back to Rome, secrets in Hector’s past and the chasms between their social classes and different faiths erect complicated barriers to any future together. Will God give two lonely hearts a second chance at happiness? Last Christmas was special. My whole family gathered together at our childhood home – a place of great beauty, good memories and peace. We dragged the dining room table and chairs to the end of the lawn and sat under the red flowers of the Pohutukawa tree dining on the richest of foods. Afterwards, we lazed on the lawn in the sunshine enjoying the satisfaction of a good meal, enhanced by our body pumping out endorphins, the natural opioids often called the ‘feel-good’ hormones. Our body and souls were satisfied. This Christmas, some will eat the richest of foods and yet still their soul will be starved: those who have wealth but no wisdom, fame but no faith; those who are grieving or lonely or in families of anger and abuse. For some, Christmas day is the loneliest day of all. Psalm 63 gives the solution to all whose soul is in a ‘dry and weary land.’ It tells us to praise God, lift up your hands to Him, and sing songs of praise. In a time of distress, when we are awake with anxiety through the watches of the night, remember God and praise him - even if you don’t feel like it. It is not called a ‘sacrifice of praise’ for nothing! If you set your mind to do these things, the word of God promises you will be satisfied as with the best Christmas meal ever. May you be richly blessed this Christmas as we celebrate the birth of Jesus Christ. With degrees in Nutrition, Public Health and Communication Cindy worked for many years as a dietitian for sports teams, food industry, media, and as a nutrition writer and speaker. Her first novel, The Pounamu Prophecy, was short listed for the 2016 Caleb Prize. She writes stories of health, history, food and faraway places at www.nutritionchic.com. 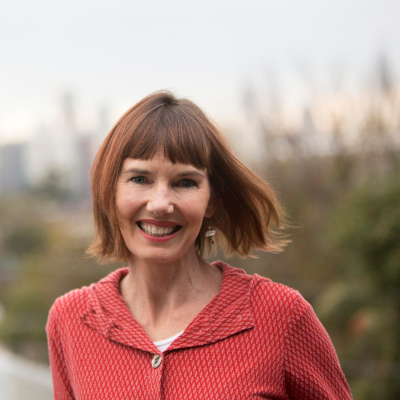 Cindy lives in Sydney with her husband and son, writing stories of flawed women who battle injustice... and sometimes find romance. We first met Julia Hale in Winning Miss Winthrop, when Julia ran away to Gretna Green to marry Thomas Hale in defiance of her family's wishes. But, as the old saying goes, "Marry in haste; repent at leisure." This means The Making of Mrs Hale follows one of the lesser-used romance tropes: a married couple falling in love. Or perhaps they are rediscovering their love, as Julia clearly still has feelings towards Thomas and vice versa. But Julia has to fight to keep what she has—a marriage to a man she loves. There is also an exciting suspense thread. Thomas is concerned his ending up in a Spanish prison may not have been an accident. This threatens him, Julia, and their attempts to rebuild their relationship while surrounded by disapproving family members. 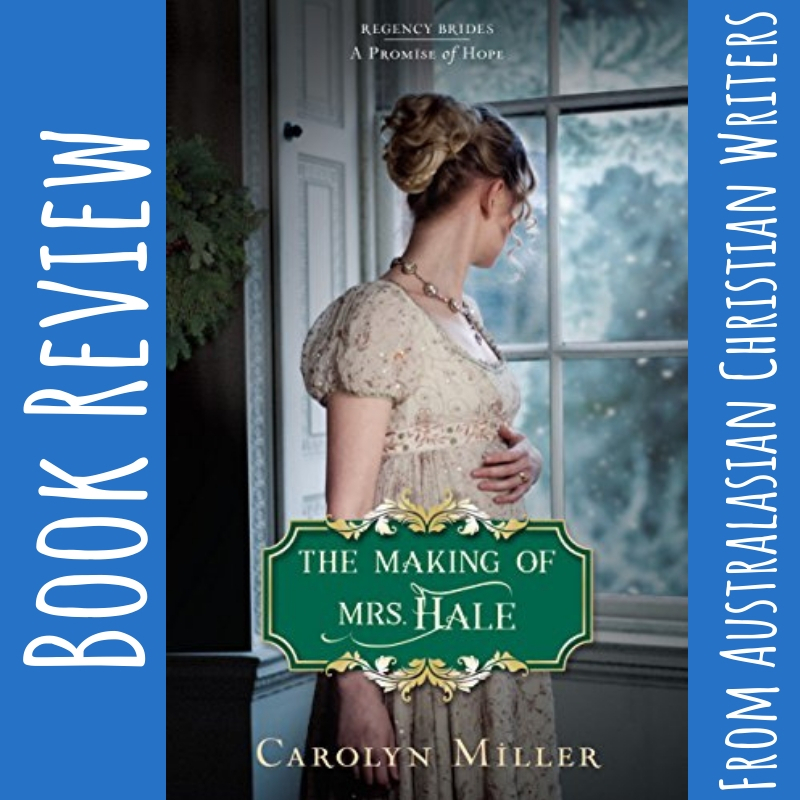 I have always been a big Regency romance fan, and Carolyn Miller has established herself as a leading author in the Christian Regency genre. Her research is spot on, yet never gets in the way of the story (I wish this was universal, but I find there are more authors who think they can write authentic Regency than actually can). In contrast, Carolyn Miller consistently comes up with realistic yet detailed plots. She fills her novels with realistic, complex characters facing issues that are true to the historic period, yet resonate with modern readers. Her novels are also definitely (and perhaps defiantly) Christian. They're not just "clean". 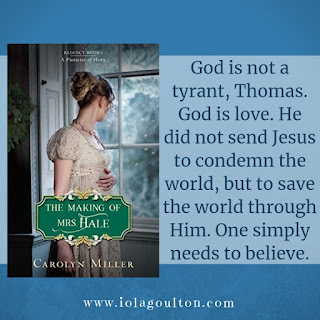 Her characters are forced to evaluate themselves and their relationship with God, which is a refreshing contrast to a lot of the fiction being published by CBA publishers. 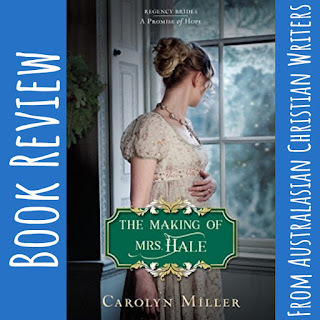 Overall, I recommend Carolyn Miller and The Making of Miss Hale to anyone looking for genuine Christian Regency fiction. Thanks to Kregel Publications and NetGalley for providing a free ebook for review.